The horse chestnut design holds two distinctions. 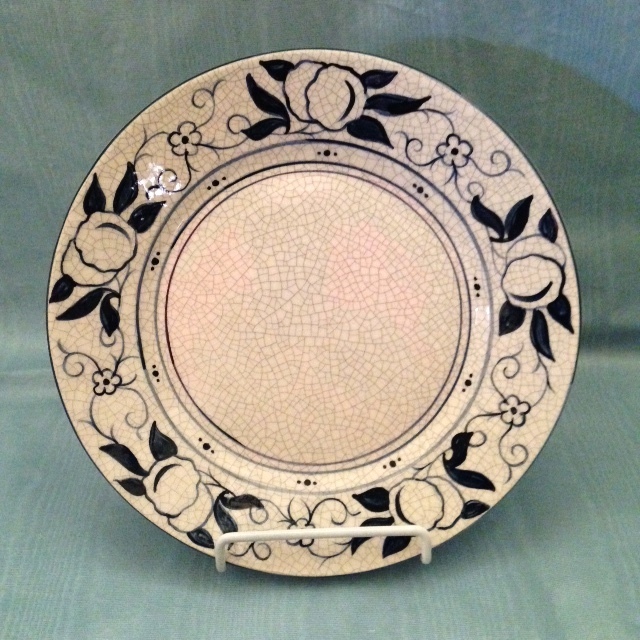 It was one of the earliest designs on Hugh Robertson's crackle-glazed dinnerware, which became known as Dedham Pottery, appearing before the business relocated from Chelsea to Dedham in 1896. It is also the least recognized motif. It has been mistaken for cotton balls, peaches, and grapefruit, non of which were Dedham Pottery designs. on Dedham Pottery was introduced more than a century ago. This New England themed design, with its asymmetrical placement of the lobster, owes much to the influence of Japanese art which had recently swept the Western art world. This particular example copies a rare example from the Society's museum collection that was painted by Maude Davenport, widely acclaimed as the pottery's finest decorator. Note the seaweed sprigs around the perimeter. Approximately 8.5" diameter. Massachusetts residents add 6.25% sales tax. U.S. shipping via insured USPS additional $12.00. For international shipping please contact the Society. We are currently experiencing problems with our gift shop. Please call us at 781-326-1385, Tuesday – Friday, 9am – 4pm EST or email society@dedhamhistorical.org to place an order via credit card. We apologize for the inconvenience.